The “historical” episodes of Doctor Who, much like the Dalek episodes, can be a mixed bag. For every fantastic entry like “Black Orchid,” “The Aztecs” or “Vincent and The Doctor,” there are more underwhelming ones like the pirate-themed “Curse of the Black Spot” or the straight-up abysmal two-parter, “Daleks in Manhattan/Evolution of the Daleks.” “Robot of Sherwood” may not aim for grandiosity or emotional resonance like some other installments in its vein, but one would be hard-pressed to say it’s not great fun. 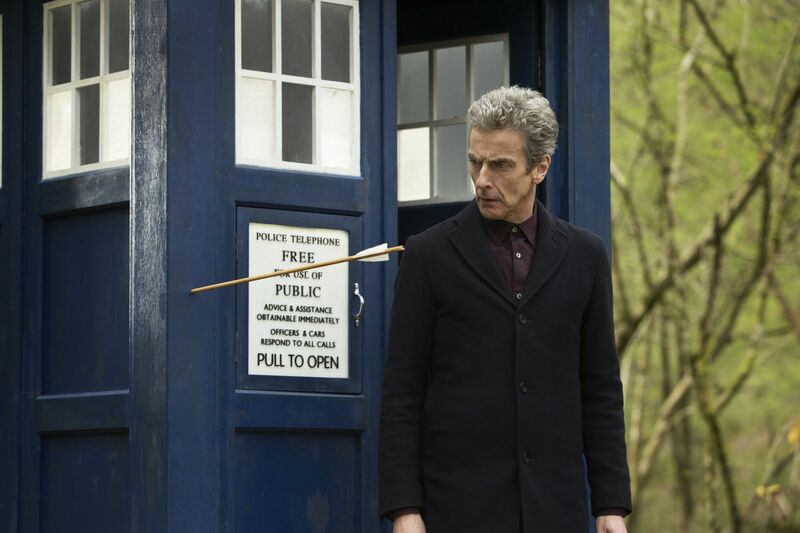 At the behest of Clara, The Doctor navigates the TARDIS to 1190 Sherwood Forrest, England. The Doctor insists their voyage will be fruitless as “Robin Hood” is just a story. Upon exiting, however, he immediately comes face-to-face with a familiar-looking bearded man decked out in bright green and carrying a bow-and-arrow. He proclaims himself “Robin of Locksley,” much to Clara’s delight. After Robin engages The Doctor in a delightfully silly swordfight (or rather a sword/spoon fight, since The Doctor uses a spoon as his weapon), the jovial hero introduces the duo to his band of Merry Men. Elsewhere the Sheriff of Nottingham is scene doing the kind of evil activities one would expect Nottingham would do—namely, kidnapping the daughter of a poor villager who has been unable to pay his dues. When the villager resists, Nottingham skewers him right in front of his horrified daughter. I should note here that it seems as if this season so far has had the biggest predilection towards a civilian body count since the Russell T. Davies era, which regularly featured the death of one or more innocents per episode. No doubt it has some connection to Moffat’s attempt to make this a “darker” season, but I believe it is worth pointing out that even the light-hearted episode features a potentially traumatic death scene. Per the episode title, however, The Doctor soon discovers that all really is not as it seems. After Robin and The Doctor participate in an archery contest against Nottingham (another episode highlight), it is revealed that the heavily armed guards are, in fact, robots. Also, much like in “Deep Breath,” the robot’s ship is disguised as a building—in this case, the castle. It’s not too long before The Doctor learns that Nottingham wishes to uses the alien robots to take England (and soon the world) for himself. Moreover, in order to repair and power their damaged ship, the robots have been collecting gold from across the land. The problem? The gold will not be enough to fix the job, and it will explode while trying to reach orbit, thus taking a good chunk of Sherwood with it. Like many playful “historical” episodes, “Robin of Sherwood” is a fun concept that could easily devolve into the simplistic “the goofy Doctor befuddles historical figures” formula. Besides its genuinely amusing set pieces, a big part of the episode’s success is in the casting. Stepping into the role of Robin Hood is Tom Riley, who currently also portrays the titular figure in Starz’s Da Vinci’s Demons. Despite his model good looks (of which The Doctor points out as being unrealistic), Riley really excels at endowing his Robin Hood with the proper amount of swagger, charm and even occasional comedic bumbling. In other words, he displays familiar elements of the 10th and 11th Doctor. As such, one of the true great pleasures of this installment is seeing him interact with the crankier, more cynical Doctor, especially in one sequence where they’re both locked in a dungeon and the Time Lord orders Robin to fake a sickness. What’s more, the episode manages to incorporate a nice theme about the nature of legends. When Robin eventually learns that all his exploits and achievements will be regarded as merely fictional stories in the future, he accepts the outcome, believing that “history is a burden” but that “stories can makes us fly.” Considering that The Doctor is, in his own way, a true figure made into legend, this idea perhaps hits a bit too close to home. Sure, this subplot provides a not-so-subtle way of integrating The Doctor’s identity crisis into the episode, but it does manage to offer the proceedings a slightly deeper meaning. If the episode has any gaping flaws it’s in the final moments. After Robin’s cool, climactic sword battle with Nottingham, our heroes find themselves outside the castle ship and watching it take off. Unfortunately, it does not have enough gold to make it out of orbit—meaning it will explode right over Sherwood. In a somewhat predictable example of Chekov’s Gun, The Doctor, Clara and Robin combine their skills to send a golden arrow, which they initially won in the archery contest, soaring into the ship and allowing it to reach space and explode out of harm’s way. And by “soaring,” I mean they literally just fire it from an ungodly distance and it somehow manages to hit a spot that allows the arrow’s gold to be registered by the ship. Doctor Who has had very silly resolutions before, but this is lazy even by the show’s traditionally low-budget standards. In the end, however, what matters is that the episode is a great ride. It’s a throwback episode that still manages to feel fresh in its execution and provides a nice change-of-plan from last week’s much darker story. Also, next week looks to have Steven Moffat returning to his “Blink” horror tendencies, which means we should be thankful of this bit of light-heartedness while we can.